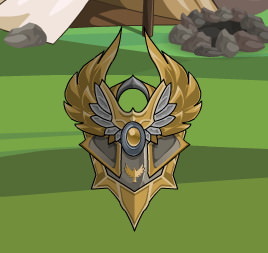 This shield is used by the soldiers of the Dragon Slayer order! It resists Fire damage and gives enhanced Melee and Ranged defence! It defends well against Dragons and their kin, and is best when defending against a Fire Dragon! Every turn, you gain 2 Meditation Charges. You can spend 40 Charges to heal the listed MP or SP. If you have one other Kindred item equipped, you gain +1 charge per turn. If you have two or more others, you gain +2 charges per turn. As a friendly reminder, please read the first post before posting. 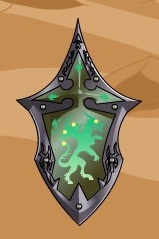 Light shield, scales like the Guardian shield but aligned to Light. MC effect attempts Daze based on % of attacks you block with the shield. It attempts to inflict a (56*Blocks/Attempts)% stun rate Daze for 2 turns, 50% save and is inflicted by VStat/LUK and resisted by END/LUK. Hmmm... I think the place for this is here? Here are the shields from among the items on the list that I managed to put together, IMR. See the weapons thread for more details. The variant form of the Dragon Strike Shield, Thunderbird Shield and Iron Bloom Shield. Basically a Fire clone of the Cryo Chrono variant, except this one scales. It'll upgrade as you reach each level tier in the table below to the listed stats. Attemps Paralyse based on your block rate. This Chronomancer's shield is powered by a flame frozen in time. It can sap the temporal energy from foes that strike it, freezing them in time for a short while! **Your foe hits the shield, which drains their temporal mana and paralyses them! **Your foe hits the shield, but endures its temporal magic! The link for the Chimeran Squire Shield in the Shield Index is broken. Monster attacks have a 3.57% chance of automatically missing. * This doesn't affect attacks that auto-hit or that have more than +300 BTH. *The lantern's light blinds your foe, causing the incoming attack to miss! A lantern used to light the way in the underworld. It wards off the powers of Darkness, and the lantern's light can blind foes when they strike, lowering the accuracy of their attacks! Numbers thanks to In Media Res and Kamui. Image and description thanks to Kay Oh. April 06, 2017: The shield was released. Fire Dragons: you take -(15/1.4)% damage. Other Dragons: you take -(7.5/1.4)% damage. Fire Drakel/Dragonkin: you take -(7.5/1.4)% damage. Other Drakel/Dragonkin: you take -(5/1.4)% damage. Numbers thanks to Kamui. Trigger and Mastercraft bonus information thanks to Relinfearous. Image and description thanks to Carandor. June 13, 2018: The shield was released. Ice shield, Magic lean for defences. MC effect lets you click on the shield once per battle to give yourself an MRM boost. 1/battle effects are worth 50% Melee, that translates to +30 MRM. This is a non-elemental effect, so *0.6 effect, for +18 MRM. ^Minor typo, you put Fire instead of Ice. The entries for both the Horo-Show Void Vindicator and Void Vindicator shields are throwing a "page deleted" error for all the links except the very first one in the list. Presumably when the entries got condensed to one page a bunch of links got removed. Earth shield, slight Melee/Magic focus. MC effect is that each time a turn passes where your foe is inflicted with Numb/Off-Balance/Entangled, then you increment a counter. This counter is dependent on how many pieces of the CoC set you have equipped. Base is +1, two pieces gives +1.5, all three gives +2. This counter is shared for both the weapon and shield, and you must be wearing at least one piece of the set when your turn ends for the counter to increment. For each point on the counter, you gain +1.2 MRM. Essentially for each turn the mob is inflicted with some sort of DEX Loss effect, you'll gain anywhere from +1.2 to +2.4 MRM. This effect caps at 10 points on the counter, or in other words +12 MRM. Scales like the armour, once you hit the level listed in the Level row, you'll get the shield stats for that column, with the PowLvl 59 column being the minimum stats. Light shield, Melee focus. MC effect is that after the foe attacks you, you gain +(33.33... * Blocks / Attempts)% LUKy Strike rate to all your player/weapon/spell attacks for the turn. On the first turn the shield is equipped, or if the foe didn't attack you in the previous turn, it'll default to just +5% LS rate. Scales up as you hit the listed level in the Level row (if an Adventurer) or the GLvl row (if a Guardian), Guardians will default to Lv 15 Power since the item has a buy level of 5. Earth shield, Magic focus. MC effect is that it triggers if the foe is affected by Choked. You take -7.14% damage from such foes. Light shield, focus on Melee/Ranged defences. MC effect is the ability to click to pay 15% Melee in SP each turn and take -(15/1.4)% damage from all attacks. Is priced as misc + shield compression, similar to Cozy Farzhad Mogloo. Scales based on tiering, if you're at the listed level, then you'll hit that tier, Lv 55 power minimum, basically scales like the Golden Dragon Head shield but with permanent Guardian scaling assumed. Energy shield, MC effect is that if the foe has DefLoss on them, you take -(10/1.4)% damage. If you're using the Ironbloom Warhammer, then this is boosted to -(15/1.4)% damage taken. Shield is an Earth one with Melee focus, MC is basically a copy of Protoparagon shield, pay 15% Melee in SP to take -(15/1.4)% damage.